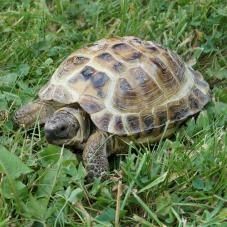 Our stock of tortoises includes: Horsfield's, Spur-Thighed, Hermann's, Red & Yellow-Footed, Leopards, Sulcatas and Indian Star Tortoises. 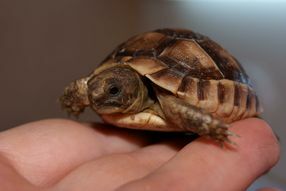 One of the hardiest tortoises, and therefore an ideal starter tortoise, is the Horsfield's tortoise. 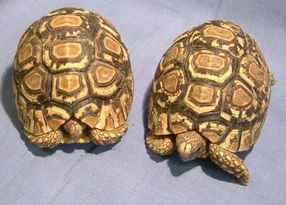 Spur-Thighed and Hermann's tortoises are CITES protected species and therefore require an Article 10 certificate when purchased. 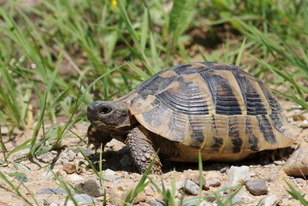 Between 1946 and 1984, over 6 million tortoises were imported in to the UK, 20 million into Europe. They mainly lived in people's gardens and hibernated during our long winter months. 80% of these tortoises died, the average life-span of most of the remaining few was about 3 years. Why?......These imported tortoises required temperatures of around 85-95 F and between 2500-3500 hours of strong sunlight (UVB light) in order to stimulate sufficient eating, digestion and metabolism of that food, as well as to absorb sufficient calcium from their diet to both grow and maintain a healthy skeletal and muscle system. Their maximum hibernation time is 2-3 months. energy stored to see them through. 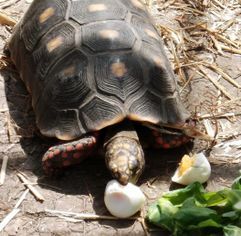 If you keep your tortoise in the garden year-round and it is more than 20 years old, you are just VERY LUCKY! Your tortoise is unlikely to be in good health, despite appearances, and will not live its full and long life-span. 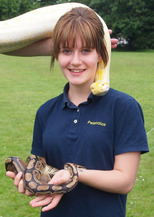 We do not sell any of our tortoises without a suitable set-up to imitate their natural habitat as closely as possible.